…and beauty of a crackling fire on a chilly evening? If so, you understand the many advantages of owning a fireplace. Fortunately, the pleasure of relaxing in front of a bright, cozy fire is no longer limited to the inside of your home. By installing an outdoor fireplace, you can experience the same satisfaction while sitting in your backyard. Deck and patio fireplaces are the latest popular trends in outdoor gear. Outdoor fireplaces are similar to their indoor counterparts and have essentially the same components. Most varieties have a firebox, flue, chimney and hearth. Because the outdoor versions are designed to mimic traditional enclosed fireplaces, they are safe enough to build on top of virtually any foundation. There are several styles to choose from, and each type varies according to design, function and fuel options. One of the most widespread varieties is the gas fireplace. Gas is typically the safest choice and is ideal for most homeowners. If you want a fireplace that is easy to clean and doesn’t create smoke or sparks, gas may be the best option for you. It’s also easy to control the heat levels on a gas fireplace, so you can always find just the right temperature for finicky guests. The disadvantage to using gas over other options is that you will need to have gas lines situated close to the fireplace. A wood-burning metal or clay chimenea is a good alternative to a gas fireplace. A chimenea is a front-loading oven with a chimney or smoke vent. This option is particularly useful if you want a sturdy and durable fireplace. Chimeneas are easy to clean, will last long and can provide you with the inviting sight, smell and sounds of logs burning on a fire. The main drawback is that metal chimeneas can become extremely hot. If you need help finding the next type of outdoor fireplace for your home, browse through our list of outdoor fireplace ideas! If you live in a colder climate and have ever longed for just one more day of summer, you will benefit from owning an outdoor fireplace. The warmth you receive from these small furnaces can extend the season considerably. Additionally, by building a fireplace on a patio or wooden deck, you instantly create a favorite recreational zone for family members, friends and neighbors. You will be the envy of your guests as you provide entertainment around a soothing, inviting fire. Most outdoor fireplaces are durable enough to withstand various types of weather, which means you can spend less time worrying and more time enjoying one of nature’s most fascinating gifts. A fireplace can also be built virtually anywhere in your yard. Regardless of whether you have synthetic turf, natural grass or even a full-sized wooden deck, you can easily install an outdoor fireplace. The design you choose will determine where you can build the unit. Before choosing a fireplace, check with your local laws regarding installation. Some codes have size limitations and fuel restrictions, and other laws require homeowners to install the unit a certain distance from the house or neighboring properties. Once you are ready to make your selection, consider where you will position the fireplace. If you plan on installing the unit on real or artificial grass, be sure to purchase sturdy, thick pavers that can withstand the weight and heat of a fireplace. When it comes to fireplaces that burn wood, a main factor to consider is the size of the basin or bowl. Some fireplaces have small basins that make loading wood difficult. Avoid using chemically treated wood, and use only kindling, logs or newspaper to start a fire. This is not only the safest method, it’s the most convenient for outdoor situations. Your fireplace should come with a cover or encasement as well, which will prevent ash from blowing onto your deck, patio or furniture. 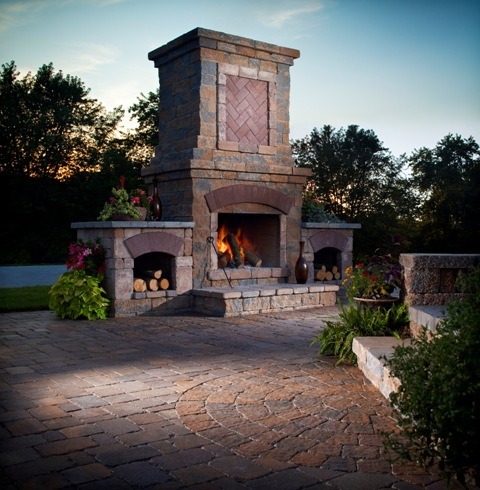 It’s best to choose a fireplace that fits your personal needs and tastes when it comes to outdoor living. Consider the type of foundation your fireplace will be built on, the functions needed for daily use, and whether or not you want a gas or wood-burning unit. Install It Direct representatives can assist you with making the best choice regarding fireplaces and paving stones. Sign up today for a free estimate or join our mailing list, and you will soon be stargazing by the glow of a warm fire.